I've finally embraced Pinterest. I set up an account a few years ago and was using it a little bit, but I didn't really grasp it's utility, both for collecting and storing creative ideas and for promoting my own work, until very recently. These past few weeks I've been working on a whole series of awesome boards, including Softie Inspiration, Nursery Rhymes, Non-Rubber Ducks, Dachshunds, and Creative Snowmen. One that's been most popular is my Free Softie Patterns board. I get it. I love free, too, and it's super helpful to collect all these visual links in one place for future reference. The more I've gotten into Pinterest the more pins I see linking to a particular type of free softie pattern. You can easily recognize these free patterns because they are all formatted the same way: green edges with the words "Pretty Toys" in orange in the top lefthand corner. The words are all in Russian. I see them every day on Pinterest. I have to wonder, what is Pretty Toys? Are these patterns uploaded with permisson? In other words, are these okay to pin, download, and use? Why are they all free? My friend and fellow soft toy maker, Miglena Doneva, lives in Bulgaria. I asked her about Pretty Toys. According to Miglena, "in Eastern Europe people do not pay for any types of patterns." Some of these are pirated for sure. Maybe all of them? This is a screenshot from a Google Image search Miglena did for me in Russian (выкройка игрушек were the search terms). 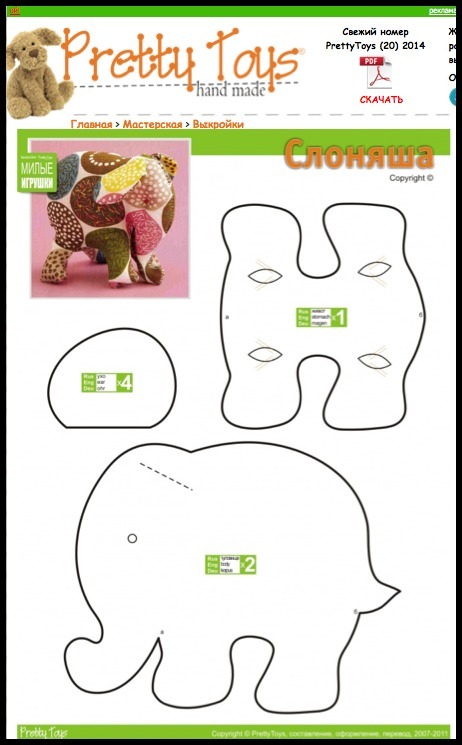 I'm not kidding you when I say there are thousands upon thousands of free softie patterns in Russian. I don't pin them, because I don't understand their origin. These aren't toys I recognize. From what I can tell they aren't pirated from American toy designers. There's a copyright symbol on almost all of the Pretty Toys patterns, and some have the name of the designer on them. Does that indicate permisson from the designer to have these designs online for free? I don't know. Many of these patterns are really only templates. Let's look at this elephant. Miglena translated the instructions for me. "This elephant can be sewn very easily. Any type of fabric, or even scraps of fabric will let you create a new toy for your kid or for a present. This elephant is very cute!" That's it. No further instructions included. I'm not sure what else I want to say about this, except to show it to you. These patterns are being circulated and recirculating thousands (millions?) of times a day on Pinterest. The world is becoming very small. What was once free, possibly pirated, material being produced in one region now has a global audience. Have you seen these free patterns around online? What do you make of them? And if you speak Russian, can you help us shed some light on their origin? I’ve seen stitch dictionaries pages passed around some knitting/crochet Pinterest boards. Now *that* bugs me because it’s clear copyright violation. Back on topic, this reminds me of my mom’s knitting and sewing books from Spain in the 1980s. (They loved their shoulder pads as well!) The instructions were just a few inches of type and very sparse. It would say, for example “Cast on and knit in pattern until 40 cms. Then begin decreasing for arm hole.” No indication about how many stitches per cm needed, how to create the pattern or even what size needle you need. You’re expected to know and figure things out on your own. My mom never used a pattern when sewing either, she just ‘knew’. I think that’s why she’s so great at reverse engineering things. I’ve never seen those patterns before, and I don’t know if I’d seek them out. I usually like a bit more “hand-holding” while I’m working on projects, such as actual instructions! 🙂 I’m so excited to see you’re on Pinterest! You have very fun boards, and lots of great pins. Thanks! I have seen these, and others. I looked for a certain style of baby bonnet and found many free patterns. I printed a few to get an idea of shape. They mostly did not have instructions, or not enough to follow. I do not need instructions for a bonnet, but it was interesting to see. I then purchased a pattern to get the shape I wanted with various sizes. I wonder if it is just a cultural thing, kind of a mix of say our great grandmothers from the 1800s who just knew dressmaking and could make a dress or whatever with no instruction, and new internet technology to spread the patterns rather than a copy over the back fence. In the past pretty much everything passed word of mouth and hand to hand, maybe it is still culturally like that there, with the newer ways. I know that is a repeat, but I am trying to think how to express myself. I have a newly purchased pattern from the 50s that would not make any sense to a new seamstress. It’s just a matter of what we know and do routinely. I noticed a few from Soft Sculpture patterns, Patterns I bought and are complicated. i tried to e-mail the designer, and never heard back from them, the patterns are still there too! I don’t speak Russian, and I don’t know about “pretty toys” (and don’t mean to discredit them or falsely accuse them of anything…) but among pattern designers here in Germany it is no secret, that patterns – specially crocheting patterns and instructions – are baught on etsy or the German equivalent, then translated and put up on free-pattern-sites – mainly in Poland and Russia. From what I’ve heard, the people behind this contact etsy-users, asking them to please buy a pattern for them and then forward it (for some reason such as “I don’t have a paypal-account” or the like). That way the purchase of the pattern before putting it online somewhere for free cannot be linked to them. And there is nothing you can do about it, unfortunately. Again…that is just a general fact of what happens over here on a regular basis. I’m not saying pretty toys has anything to do with it. I have seen what seems like hundreds of free patterns posted on pinterest–from garments to softies. I really don’t care to download them, though. I have done enough pattern drafting to know that there is a tremendous amount of work that goes into creating a good pattern and clear instructions to make it. That said, I would imagine you get what you pay for :(. So, I would rather purchase a pattern from someone who has a proven track record for well-drafted patterns that work (i.e. someone has actually made it!) and the ability to write/photograph the steps in a way that leave little room for frustration. That’s why i love your patterns and your books, Abby! You are so generous to post free patterns from time to time–but I would happily purchase them anyway because I know they will work. Life is way too short to mess around with “free” frustration–legal or not. wow! I’ve never seen these free patterns which surprises me as I’m a big Pinterest user. These patterns wouldn’t interest me as I like a bit instruction to come with my pattern. I’m not at the expert sewing level where I can figure it out. I’m sure even if I ever get to that level I will still buy patterns as I’d prefer someone else to do all the puzzling out how it goes together. I do pin a lot of free tutorials that blogs post but I assume that makes bloggers happy as it drives traffic to their blog. I’ve even made some of the tutorials and added them to my present ideas list. I lead a doll making group. A member from Russia kindly shared a pattern. I removed it as it was copyrighted. She had good intentions. Her husband explained that thr U. S. Is “very strict” about pattern cooyright. Interesting about the cuktural differences for patterns. I’ve had lots of Purchases of my pattern from Russia. Hmmmm. Annnnnnd the ipad typos strike again. Oops! To be honest I only use Pinterest as my own personal pin boards (although anyone else is welcome to help themselves to my rather varied collection lol) I do know that it’s not just Russia that this is a problem, there’s other Eastern European countries, not to mention Far Eastern ones that do the same thing with patterns that are effectively stolen. Mind you, I’m not sure which is worse, that or the people I’ve come across in countries where copyright is very well known and enforced that photocopy/scan in books and patterns and SELL them! Someone I follow on Pinterest (although I can’t figure out who, right now) actually said that one of her patterns appeared on this site, but it’s not complete. Obviously, it doesn’t have detailed instructions, but it was apparently also missing pattern pieces. I think that it’s kind of like a scam. It gets people interested, and gets them traffic on their site, but it’s not delivering a complete product. If I can find the user on Pinterest, I’ll share a link. Russia and Brazil seem to be the 2 biggest countries where pattern piracy is high. I have seen just about everything hit the pirate trade, from crochet patterns to craft books (including Abby’s Artful Bird). Once it has hit the Russian book download sites, it is too far gone; it has already been privately traded for months. Japanese craft books of all types seem to be the most popular, with American ones closely following. There are even people on Etsy SELLING pirated pdfs of Japanese and Korean craft books! If you can keep your book from the mainstream trade (off the Russian sites) for a full year, you are doing great! Things like large full size pattern sheets inhibit piracy because they are more difficult for the pirates to copy. Really large books also show up more infrequently for the same reason. I am Russian, and I can help in any kind of translation. Once I’ve seen people who were selling sewing kits at the exhibitions. The patterns were stolen! And they even didn’t bother to remove the name of the author. The common practice here is: if it’s on Internet, it belongs to everybody. Personally I prefer to purchase the patterns if I can. I have been trying to get Russian amigurumi knitted doll patterns in English. I have tried everything the site has told me and nothing has worked.I love the patterns and would love to make them. Can you help me? I have seen these patterns, i think I may have pinned a few in the beginning, but the more I saw the more I started doubting the same issues you adressed. I live in brazil and its true what Heidi said, brazil is also very big on piracy, especially facebook groups are now the place where patterns from over the web are shared, they gain a lot of traffic from this. As I really don’t want to do this, and only post links to free patterns to the source (the deigner’s website) I even feel I am not able to get as much traffic as people prefere the quick access when its posted straight away, but at the same time when someone copies something they have made themselves they make a huge schandal, so crazy, somehow it does look like as long as you can download a patterns fre from the net you are ok to use it…. It’s important to point out that these free patterns from Pretty Toys are reposted on all sorts of sites, including many that are making money in ad revenue (some of the ads are rather pornographic). If the patterns are indeed pirated and resposted for free, people are generating income from those posts. I agree with you, Kathy. I’ve talked with the folks at Etsy about this issue because as you say, many sellers scan books and resell the scans as PDF patterns without permission from the author or publisher. Reporting these violators to Etsy actually doesn’t do anything unless you are the copyright holder. All the more reason for more craft books to have pull-out pattern sheets! Gosh, traffic is a big motivator, especially if you are getting ad revenue from your site. This black market is huge and growing every day. I do not speak Russian but have seen these patterns around too. I found them on a Google search before I found them on Pinterest. I have even used them- a bear for my dad and a rat for my kiddo. Some are so basic I tend to think they are incomplete! My understanding is that Pretty Toys is actually a magazine- http://www.prettytoys.ru will take you to their website and they have a facebook page too. I love looking at their items- they have a great digital magazine and the artists covered in there are superb, varied in their doll/softie craft and they cover the whole world with great articles on the artists. You have to subscribe to get their magazine (they do have a digital English version). Maybe once you are printed in there the artist understands the pattern is going to be widely (and free-ly) circulated? I often pin them for inspiration but it is tough for me to work on a pattern that is not in English. Unless the parts are obvious. The bear was gorgeous- a polar bear. What your friend said strikes a chord with things I’ve heard in other countries as well. When I was in Vietnam, I was told that I could never have my business there, because people would just email my patterns around and would never pay for them. I’ve gotten a recent burst in facebook fans from Latin America, and there too, there is a vibe that patterns are just things you get for free. I don’t think my customers would be very happy with that! So, in a sense, I think Americans are willing to pay because there is an expectation of more information and detail. I think free patterns on the internet are huge – both the legitimate and pilfered kind. I think that often they come with limited instructions or limitations (i.e. in another language). So although many may like the look of them, when it comes to using them, its another matter. Also, people in Russia are not generally going to be buying books from overseas so the fact that they are using pirate copies does necessarily impinge on how many copies sold, as they wouldn’t be buying them anyway. I have seen plenty of crochet patterns on sites I imagine are not legitimate, also pdf scans of Japanese craft books on etsy. Yet read the reviews and you find you don’t get the whole deal anyway. I have honestly never been tempted. I think many who buy patterns want to support the industry and feel proud to do so. Also some people have loyal customers that are drawn to their products and ‘lifestyle’. They would not be in the market for a freebie from an unknown source. However there are some people who just do not want to pay for patterns and would literally beg borrow or steal before doing so. I think there have always been people like that. They are not going to be paying customers, although I suppose some of this group borrow from the library which is legitimate and the writer does get paid something. Although I think people are certainly having their patterns ripped off, I’m not sure if it is at great financial cost. I could be wrong. Of course, there is no credit or recognition for the pattern either which isn’t nice. I’m not sure the genie can be put back into the bottle. Copyright only really seems to stand a chance of working in the country of origination. That is where it seems to me the majority of buyers are going to be from too – unless it is a translated book. I’ve definitely seem patterns I recognize from older books by Carolyn Vosburg-Hall (pig, zebra, lion, dragon), Jodi Davis (coyote), Rudi De Sarigny (horse, camel) and “100 Soft Toys” (mom cat and kittens, designer uncredited), plus some I can’t recall the name of the author offhand. You can (and should) send a cease-and-desist letter to any infringer in the U.S. who is violating the terms of the DCMA. It’s murkier in the international arena, though the EU does have intellectual property protection directives, and most countries are members of the World Intellectual Property Organization. What it boils down to, however, and what infringers bank on is this: you must do your own copyright policing and enforcing, and that requires resources that small businesses, and particularly individuals, do not have. The provisions are in place to punish infringers, and if you use the term “Super Bowl” or “Winter Olympics” you’ll experience them in full force. But only players like the IOC and the NFL can truly enforce their copyrights. It’s a harsh reality. I’ve seen some of my (free) patterns reposted there, including some images from my blog that were untried first drafts – I feel sorry for the people who tried making those! Amusing toy , looks great and is easy to manufacture . You can sew from any tissue of a combination of different fabrics – nothing will spoil this elephant. The brighter the toy is , the better. Or a desire to show imagination and come up with other animals in this style ? If possible, share with us . Using Google translate further, it appears to me that Pretty Toys is an e-magazine. Thanks for bringing this issue to my attention. I love Pinterest. I have cooked many a dinner from food I have pinned and the crafts and art inspire me. It’s like window shopping. But it never occurred to me that some of these patterns would be pirated. I will definitely be more cognizant of what I pin and will check my boards for any of these patterns. I just started selling my own stitchery patterns. I hope I never see my patterns pirated on Pinterest! Someone in one of my Facebook groups recently published “free” doll patterns. A little research and some email soon showed me one of them had been reprinted without permission from someone who depends on selling her patterns to make money. This was one of their earlier piratings, which still had “Copyright by DeRue Johnson” printed in the margin. I notice that latter patterns seem to have removed the designer’s name and just say “Copyright” or “Copyright by Pretty Toys”. I’m American but I’ve lived in China for the past 15 years teaching English both spoken and written and I have to say that very few people here have any concept of copyright. There is no understanding whatsoever of why anyone would want to prevent others from copying them either patterns or words because copying someone else’s work is considered a form of respect and honor…i.e. their work is so good everyone wants to use it! So, part of it is definitely cultural. That’s such an interesting perspective, Carolyn. Wow! Such a different cultural take on ownership of an idea. I am a Russian, who has not been home in 20 -or-so years. 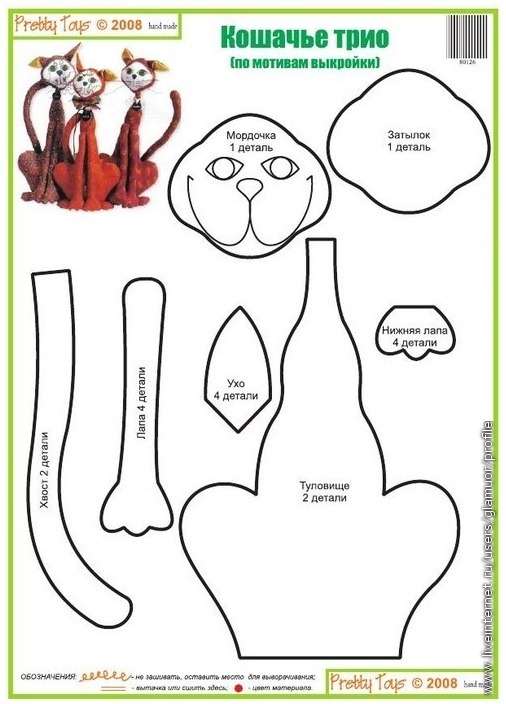 I came across these because I was searching for DIY stuffed animal kits – as in a pattern + fabric sets . When I was 8 or 10 – back in Soviet Union days – I received such a kit/set as a gift – not an import, it was made in Russia / USSR. Now – 20 years later -, I wanted to get some for my kids. But I can’t find anything of the sort on the internet. Any one know a seller? RE: instructions. I am used to Burda Moden – translated from German to Russian – that was the most common source of patterns that I remember from 1988 – 1996. Yes, to sew a Jacket with lining instructions were welcome. But for the Pretty Toys – really? these are quite self-explanatory…. It is a magazine of the same name, printed in English and Russian. The patterns are under copy write. if you subscribe on line,. (which I believe is free) as a guest you can download one copy of a pattern for your non-commercial use. The cats, Sadie and Jinx, are © Barefoot Primitives. They are for sale on Etsy. I’d be leary of any of those Pretty Toys “free” patterns.